1. 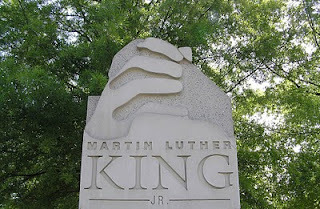 You could easily spend the day at the Martin Luther King Historic Site in downtown Atlanta. Probably, one of the most memorable parts of the visit was listening to his speeches in the half-hour video in the Visitor's Center as well as standing not far from the original mule-drawn wagon that transported his casket during the funeral. From there, you can gaze all the way to the King Center across the street where his tomb and that of his wife, Coretta Scott King, sit side by side above a reflecting pool. The site also has a petite rose garden where you can see peace poems written by children. Make sure you have time to tour the adjacent preservation district in this neighborhood, Sweet Auburn that was once home to a very well-to-do African American population. 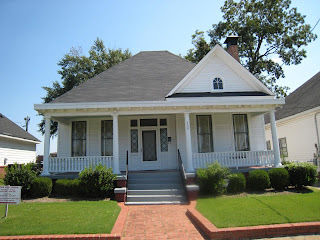 One of the Queen Anne style houses is the birth home of MLK -- it's definitely worth making a reservation for the visit. You'll be able to roam from room to room and hear stories of what board games MLK liked to play in the living room -- it was Monopoly; learn that adults and children sat and talked together at meal time, something that was unusual at that time; and see MLK's favorite room, the kitchen, where he would sit and eat his grandmother's home cooking. 2. Anyone who loves airplanes will delight in the Tuskegee Airmen National Historic Site that honors the all-Black squadrons of Airmen who were active in World War II. At this time, only Hangar 1 is open, but there's a wealth of artifacts here to keep you occupied. And this place isn't just for adults. Kids will enjoy trying to fold a silk parachute into a pack. There are plenty of audio displays to listen to, mostly of Airmen or their instructors -- something that really makes the place come alive. You'll hear how the instructors put the men through a closet cockpit flight simulator so that they could learn to fly by instruments only. As one instructor said, "I can introduce rough air and make him pretty miserable...You can crack that thing and he [pilot] just steps out." 3. 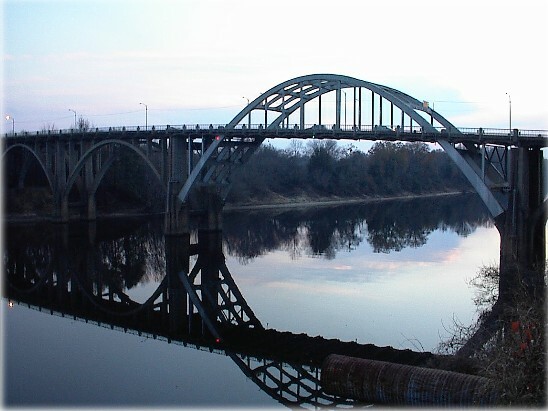 The Selma to Montgomery National Historic Trail runs from Montgomery, Alabama to Selma with plenty of civil rights sites in both cities as well as a museum (The Lowndes County Voting Rights Trail Interpretive Center) in the middle and signs to other sites along the way. The 54-mile trail honors the African-Americans who sought their civil rights and, after two unsuccessful tries -- the first being the infamous Bloody Sunday -- finally made it to Montgomery to present their grievances to Governor George Wallace. Montgomery makes a good stop-over city to do the entire trail. And though the trail can be done in a day, to truly get the most out of it, you should spend a day doing all the sights just in Montgomery, and reserve an additional day to doing the Interpretive Center and the sites in Selma. Another stop that's mandatory is the Dexter Parsonage , the house where MLK and his wife lived when he was pastor of the Dexter Avenue King Memorial Baptist Church in Montgomery. You have to make a reservation but, again, the visit is memorable, especially because of the guide, Shirley Cherry, who knows plenty of what went on in this house, including on the porch where you can still see the damage from the bomb that exploded while Dr. King's wife and baby were in the house. After all of these museums, you may think why visit yet another one: the Voting Rights Trail Interpretive Center. That would be a mistake. Again, a wealth of information awaits, with plenty of surprises. For example, the video here is extremely emotional as it provides interviews with actual participants of the marches. And I learned that the center is on land where many African-Americans were forced to camp because they were thrown out of their houses after they had registered to vote. The exhibits provide artifacts from the marches, including photos of Bloody Sunday. Outside you can walk a short loop where signage explains the spot where the marchers passed and what the harsh reality of daily life in the tent was like. On the south side of the Edmund Petus Bridge that leads into Selma and where the state troopers and sheriff's deputies waited to assail the marchers with tear gas and batons, you'll find the new location for the National Voting Rights Museum. Yes, another museum and another must visit in my book because there is no redundancy among all these venues. They all add to the story. Here you'll see actual quotes written on the wall from participants as well as some of the threatening utterances from the troopers. You'll also find shoe prints from the foot soldiers, the marchers themselves, who were by far, not the leaders; they were the ordinary people that were firm in their commitment to the cause for equality. Sounds like some amazing spots to visit. I've never spent much time in the South, but I'd like to. A couple years ago I visited the Museum of African-American Culture in Detroit with my kids. It was a powerful experience. I thoroughly enjoy visiting historical sights--thanks for all this great info! These sound like amazing places to visit. I have not visited that part of the country much but would like to. What a neat trip! I wouldn't have thought to visit these places, but it sounds fascinating (and very historical). This would make a great roundup for a travel magazine, because it's a little more off-beat but very relevant to America's past. I grew up in the deep south, and these places were close to home. for those who may not be that familiar with this part of history (as well as for those who are), the documentary series Eyes on Prize is a good place to start. originally on PBS, now avaialble on dvd I believe. Hi Kristen, I've never been to the Museum of African-American Culture in Detroit. I'd love to check it out. Thanks for the heads up. Hi marthaandme, This is my first trip to Alabama. I'd like to do more traveling in the south as well. Hi Susan, Thanks for your enthusiastic comments. It's great when you can combine a road trip with lessons in history. Hi kerry, thanks for mentioning "Eyes on the Prize." I was able to view it when I was on my trip. Very powerful! 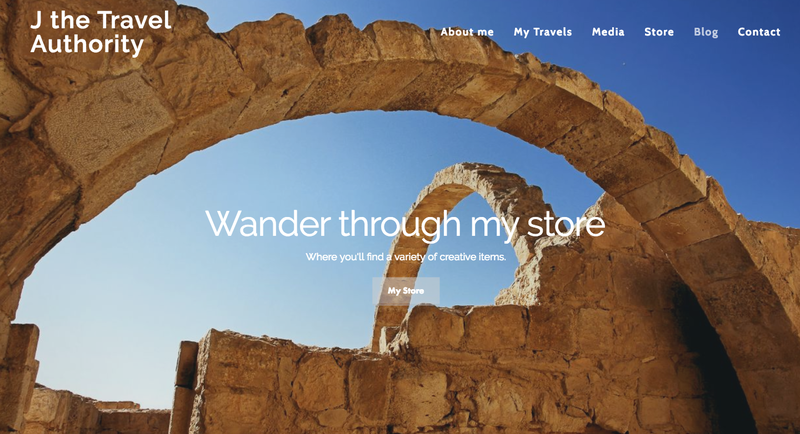 Great ideas on sites to visit. 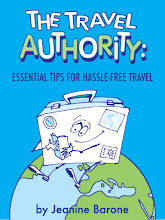 It's nice to be able to offer this type of educational focus when traveling, especially with kids. This sounds like such an amazing trip! I love combining travel and history, so your trip sounds like a dream. Hi Alisa, I agree. The kids would completely enjoy learning about history if you were to take this road trip. It was full of revelations. Hi Jesaka, Thanks for your kind comments. Combining history and travel is always a great combination. Talk about bringing history alive. Haven't been to this part of the world in ages but remember how when there the sense of the civil rights movement was palpable. great trip for elementary age kids, too. Hi sarah, Yes, kids of all ages will be totally captivated by the images and stories they'll see and hear along the Selma to Montgomery trail as well as in Atlanta. This is a tour I've long wanted to take. Your post makes me want to go even more. Thanks for the info here. So much history and that makes traveling all the more exciting. Hi The Writer's [Innter] Journey, Glad you enjoyed the post. I hope you make it down to Georgia and Alabama to check out these sites. Awesome post. My parents used to make it a point to take me down to the south to teach me more fully about what was going on in the 50s and 60s. Some of your pictures are places that I have been, there is much to be said about going down and see what has changed... and unfortunately, what hasn't. Hi Name Tags, thanks for your comments. I'm glad you got to travel down there as well. This was my first time and it certainly provided eye-opening experiences. What a wonderful post, such a great pleace I love it hear, thank you for sharing.